Embezzlement is theft—the unlawful taking or misappropriation of property that has been entrusted. A fraudulent conversion of another’s property by a trusted person like an employee or a business agent–someone with a fiduciary responsibility. In a classic sense, it’s stealing or misappropriating someone else’s investment or stealing from an employer. Individuals prosecuted are generally persons managing public and private investments where large amounts of money are discovered missing–usually involving a sophisticated scheme and law enforcement suspect an embezzlement. 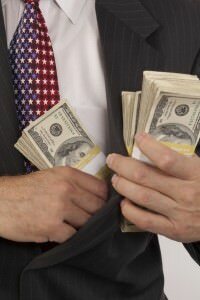 But an embezzlement can also involve small amounts of money as when an employee “pads” an expense voucher. Accordingly, members whose background also includes FBI Embezzlement can be a great asset to someone looking for an investigator and/or needing an expert trying to find concealed assets. Sophisticated embezzling schemes usually involve fictitious vendors and bogus invoices, check kiting and phantom employees. The more elaborate an embezzlement scheme the more likely a conspiracy existed among fund managers to steal the money. And the more injurious an embezzlement scheme, the more likely law enforcement will find a Ponzi scheme at the heart of the conspiracy with early investors paid with money received from later investors–attracting new investors. Thought to be responsible for the largest financial fraud in U.S. history, on June 29, 2009, Bernard Madoff was sentenced to 150 years in prison for orchestrating an embezzlement scheme involving more than $65 billion where authorities say investors lost about $18 billion. Members’ listing FBI Embezzlement as a skillset can be very helpful to law firms, security professionals and/or journalists, wanting to speak with someone about concealed assets, needing an investigator and/or expert to conduct an investigation, render a professional opinion and/or provide media commentary. Asked to review evidence reflecting someone might be hiding assets, members whose skills include FBI Embezzlement can analyze digital evidence, provide testimony, and/or when solicited, produce an affidavit documenting concealed assets and/or fraudulent statements. Besides having an expertise concerning FBI Embezzlement, these members also have important organizational, analytical and reporting skills, needed to examine and present evidence and/or locate and interview witnesses. Worried about security, learning about fraudulent statements, members listing FBI Embezzlement can provide valuable insight and guidance protecting assets and setting up a security plan. Specifying FBI Embezzlement as a skillset, these members also have the training, expertise and contacts to identify witnesses and locate concealed assets, “not” only locally, but at the state and federal level as well. Likewise, many members whose backgrounds include FBI Embezzlement also have media experience, and can provide journalists and news outlets with commentary about fraudulent schemes and concealing assets. Able to cite policy manuals and investigative techniques, presented with a criminal complaint and/or an indictment, members listing FBI Embezzlement can provide viewers and listeners with background information needed to explain charges and/or fraudulent scheme. Need additional information about a member whose background includes FBI Embezzlement, just make contact with the member and make inquiry using the information provided. Looking for an FBI Embezzlement—website visitors need only use the search feature, entering the appropriate skill, as well as the geographical area of preference and make contact with an FBI Embezzlement expert using the information provided. Retired FBI Agents and Analysts, interested in securing a Directory listing and/or a personal email address who have a background that includes FBI Embezzlement, need only submit a brief online application to join the website.